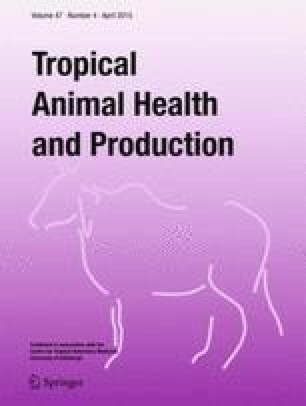 The effect of Leucaena leucocephala inclusion in sheep diets upon rumen function was evaluated. Nine Pelibuey sheep, 32.6 ± 5.33 kg live weight (LW), fitted with rumen cannula were used. A complete randomized block design was employed. Two experimental periods of 60 days each, with 60-day intervals between them, were used. Experimental treatments were as follows (n = 6): T1 (control), 100 % Pennisetum purpureum grass; T2, 20 % L. leucocephala + 80 % P. purpureum; T3, 40 % L. leucocephala + 60 % P. purpureum. In situ rumen neutral detergent fiber (aNDF) and crude protein (CP) degradation, dry matter intake (DMI), volatile fatty acids (VFA) production, estimated methane (CH4) yield, rumen pH, ammonia nitrogen (N-NH3), and protozoa counts were measured. The aNDF in situ rumen degradation of P. purpureum and leucaena was higher (P < 0.05) in T2 and T3. Leucaena CP degradation was higher in T2 and T3 but for P. purpureum it was only significantly higher in T3. Leucaena aNDF and CP degradation rate (c) was 50 % higher (P < 0.05) in T2 and T3, but only higher in T3 for P. purpureum. Voluntary intake and rumen (N-NH3) was higher in T2 and T3 (P = 0.0001, P = 0.005, respectively). Molar VFA proportions were similar for all treatments (P > 0.05). Protozoa counts and in vitro gas production (48 h) were lower in T2 and T3 (P < 0.05, P < 0.0001). Estimated methane yield (mol CH4/day) was higher in sheep fed leucaena (P < 0.0001). However, CH4 yield relative to animal performance (mol CH4/g LW gain) was lower in T2 and T3 (P < 0.0001). In summary, these results indicate that including L. leucocephala in sheep diets did not modify rumen fermentation pattern (same VFA ratios) nor reduce the amount of CH4 per unit of DMI (mol CH4/g DMI). However, leucaena inclusion does increase rumen N-NH3, aNDF and CP digestibility, and voluntary intake. The authors thank the financial support from Consejo Nacional de Ciencia y Tecnología (CONACyT), Mexico (Project FORDECyT No. 117072), and the “Fundación Produce Michoacan,” Mexico. The senior author acknowledges CONACyT for a scholarship to undergo Ph.D. studies.